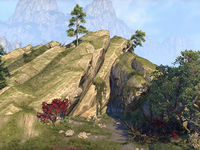 Gryphon Aerie is a cliff located east of King's Haven Pass Wayshrine on Summerset. Several gryphon nests can be found in the surrounding area. Gryphon Grievance: Help a Bosmer find her lost companions within gryphon nesting grounds. This page was last modified on 19 November 2018, at 07:31.